I’ve been meaning to visit Belfast for a while, but as it’s so close to my brother’s in Dublin I’ve always thought, ‘well I just want to see family now, maybe next time.’ But with the move to HK imminent I knew now was better than ‘next time’ so squeezed in a day trip before heading down South. After a 4am start I was on the bus from George Best City Airport to the Visit Belfast Centre to drop my wheelie case off for day storage (£3.50) before joining the DC walking tour. With some time to kill I sat a little dazed, with a coffee, in the sunshine just outside the Belfast City Hall. Paul our guide gave us a brief overview of the English involvement in Ireland and how the split between the Catholics and Protestants came about. We were told the tour would be focusing on 1971-76, when the Troubles (as they are understatedly called) were at their worst, after the British army arrived in 1969. I won’t go into too much detail of the tour but what was striking, compared to most post conflict cities, there were no memorials, or plaques. Most of the places we were specifically shown, in which major incidents happened were now just shops. The name of the group DC stood for ‘Dead City,’ explained to us because what used to be the city centre and main social hub around the Grand Hotel (which became a British Military base in the 1970’s), the Celebrity Club and other pubs, restaurants are all gone, and now, after shop closing hours the area is deserted. A couple who had been down that street night the night before nodded eagerly in recognition. Paul expressed this as conflict behaviour in a Post Conflict society. He told us of what he coined the ‘electricity of tension,’ and how it was still felt everywhere; that even a visit to the cinema could bring out political aggression. We heard tragic stories of the bombings of innocent civilians, many today with still unclaimed responsibility such as the Castle Lane bombing that killed two and wounded physically & mentally so many more. I learnt of ‘Shankill butchers’ a Protestant group who used vile methods of torture in 1979 and the execution of three young Scottish soldiers in a field after following some girls they met in a pub to a supposed party as part of an entrapment plan was a story that stood out. To counter this we were told of the Catholic Tartan gangs who adhered to similar violent tactics against civilians. Walking around the city centre it was hard to believe that this was all so recent, but because of that it’s not hard to believe and understand that there is still tension and paranoia, coupled with open wounds and many people suffering from PTSD. The question often asked is what to do about it – should the past be dug up and discussed? Should justice be sought? Or will this stir up old issues? And a more pressing and a recent addition is the added complexity of what will happen after Brexit, this uncertainty looming over Northern Ireland. One of my relatives used to work in NI but lives just north of Dublin. The prospect of having to shut the borders again does not seem like a positive one. It was heartening to learn about the Harp Bar, a punk venue where both sides came to hang out and mingle instead of throwing stones at each other. (Paul’s words!) Bands like Still Little Fingers used to play there.. and the meaning of the lyrics of Alternative Ulster suddenly clicked into place for me! Duh. I, rather naively was expecting to see very little on my taxi tour. A couple of murals and the streets where things happened, but like in the city centre, invisible signs. But when I ventured out of the city centre with Paddy Campbell’s Black Cab Tours I was, in a word, stunned, by what I saw. Driving out to Shankill and suddenly seeing the all the Union Jack flags – not a sight you would ever see in the UK, aside from potentially on a ‘royal’ day such as the 2012 wedding, and other than that flags flown tend to be that of individual country rather than a Union Jack. In the Protestant areas there were WW1 memorial murals and references. Firey, aggressive language. In contrast the Catholic areas were devoid of flags and the murals focused on peace with pictures of Nelson Mandela and slogans about unity and equality. I think because, as one of my guides said, the conflict was not something you would expect in a Western European democracy, the level of divide I saw today shocked me so much. I knew the conflict was horrific, but I ignorantly thought the feelings were more in the past than they are. My biggest shock was seeing how physically big the divide still is. I had no idea about the ‘Peace’ walls/peace lines and they reminded me of what I’d recently seen in Palestine, physically dividing one group from another, let alone going into the mental divide this then widens. The walls vary from a few hundred yards to 5km and some have gates at the end which are locked each night by Police. Another huge shock was being told about, and shown photos and footage of the celebrations on William of Orange day, 12th July each year. The ’11th night’ is a celebration of the defeat at the Battle of the Boyne, celebrating the revolution and war in Ireland 1688-91, the outcome of which ensuring British dominance in Ireland. This loyalist celebration comes in the form of HUGE bonfires like I have NEVER seen before. Some over 100ft tall. 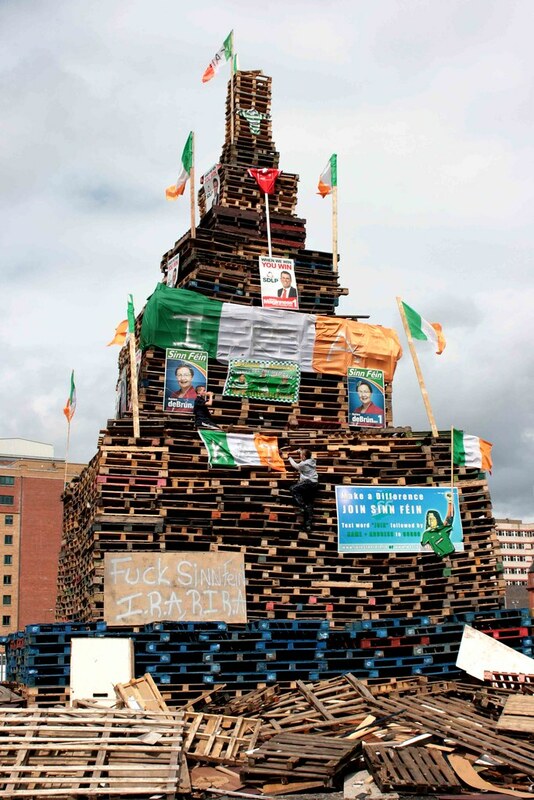 Massive towers made of crates piled on top of each other are adorned with Republic of Ireland flags, effigies and symbols of Catholicism. I have no idea what percentage of the non Catholic population celebrate in this way (and hope it’s the minority) but the impact must be huge. Here’s a few pictures (not mine), but definitely worth a further Google and a YouTube video. Just in case that wasn’t enough information in one day I asked to be dropped off at the Titanic Museum. . Always fascinated by the Titanic I was watching the old black and whites long before the Rose and Jack (J…J..Jack…) movie came out so was pretty excited. Though the museum is based around the tragic story of the Titanic in reality it’s much more than that; a history of Belfast and an insight into ship building. Both I thought, were fascinating. There’s even a little ride through a replica shipyard, which I found a little more fun than a 34 year old women probably should! They even let me store my little wheely case in the office for free. Finally, worn out, I made my way following the harbour path to the Train Station. Famished I was looking forward to grabbing some food (even just some bread) and sitting on the train. Of course being a Londoner I forget that most stations are a little smaller with less facilities. And being a vegan? Nothing for me.. I sat munching my vending machine bought skittles and crisps, overwhelmed by the massive history tour I’d just been on, very much looking forward to going on the longest wooden rollercoaster in Europe, as I’d been promised a trip to Tayto Park, just outside Dublin with my niece and nephew the following day. Someone said to me recently they think it’s stupid when people just go away for a weekend, because you can’t really get to know a place – and for me, even going for a day opens your eyes to a new history, culture, people, environment. It’s not about ticking off places (I didn’t know how many countries I’d been to until recently my niece forced me to count. That 10 year old can get me to do anything…) but what I learn from even just one day soaking up a place? Immeasurable in comparison to googling, reading or watching documentaries. Despite all I’ve written above I found Belfast to be a really vibrant, friendly city with warm people to match, and would definitely recommend anyone to take a trip there! IMPORTANT NOTE! Please remember that I do not claim to know much at all about ‘The Troubles’ and the main reason for visiting Belfast was to find out more of a general background and check out how it is now – I’d only heard good things! What I write about is what I was shown, saw and told that day, and how it made me feel. My initial reactions. Please do not attack me if there is something in here you find utterly offensive and think is just plain wrong, but please educate me.